- the programs are different ! 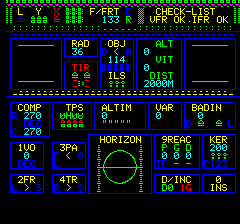 Both manuals were scanned, the 2nd in GIF to spend less disk space. 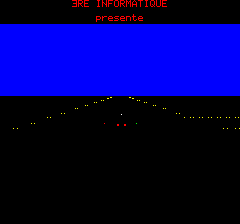 Small manual, labelled "Oric-1", that fits in the cassette box. 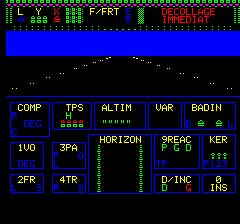 The manual is bigger and is labelled "Atmos/Oric-1". The inlay doesn't have the ads. The demo is not on the tape anymore. 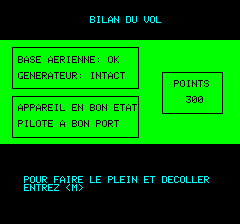 The "ecole de pilotage" is the same program than "interception", but with no enemies. 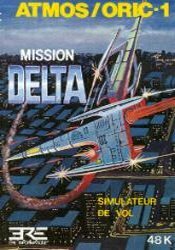 Other tapes seem to have been mislabelled, I have seen tapes supposed to be "terreur", but that holded Mission Delta ! hÃ© no !! You understand nothing because it's not a game ! 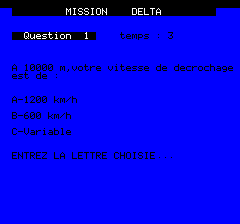 will you put 1 point to microsoft flight simulator because you don't like simulator and are unable to learn flight basic notions ? 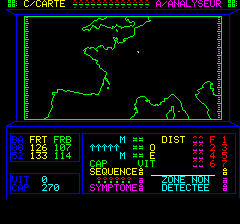 pfff it's a soft absolutly unique on ORIC, it must be compared with other simulators of 1983, not with Space-invader ! Simulator Interest & realism: 6/5 !!! !